As Africa transitions from the margins to the mainstream of the global economy, technology is playing an increasingly significant role. Bolstering regional trends in business, investment and modernization is the emergence of an IT ecosystem – a growing patchwork of entrepreneurs, tech ventures and innovation centres coalescing from country to country. Nigeria is a hotbed for start-up activity. Facebook, Netflix and SAP have recently expanded in Africa. And Silicon Valley investment is funnelling into ventures from South Africa to Kenya. Most discussions of the origins of Africa’s tech movement circle back to Kenya, which laid down four markers between 2007 and 2010 to inspire the country’s Silicon Savannah moniker: mobile money, a globally recognized crowdsourcing app, Africa’s tech incubator model, and a genuine government commitment to ICT policy. In 2007, Kenyan telecom Safaricom launched the M-Pesa mobile money product. It grew rapidly to become perhaps Africa’s most recognized example of technological leapfrogging: launching ordinary citizens with mobile phones right over bricks-and-mortar banking into the digital economy. Shortly after M-Pesa’s introduction, four technologists created the Ushahidi crowdsourcing app, a highly effective tool for digitally mapping demographic events anywhere in the world. Ushahidi has since become an international tech company with multiple applications in over 20 countries. In 2008, Ushahidi co-founder Erik Hersman hatched Nairobi’s iHub innovation centre after identifying the need to create a “nexus point for technologists, investors and tech companies”. Since 2010, iHub has produced 152 companies and grown a membership base of nearly 20,000 techies. iHub influenced Africa’s incubator movement, inspiring the upsurge in tech hubs across the continent. Another Kenyan milestone was the government’s 2010 completion of The East African Marine System (TEAMS) undersea fibre optic cable project. TEAMS increased East African broadband and led to the establishment of Kenya’s Information and Communication Technology (ICT) Authority. Notable as it has become, Silicon Savannah is but one corner of Sub-Saharan Africa’s tech scene. Across the region a Silicon Valley inspired network is developing. 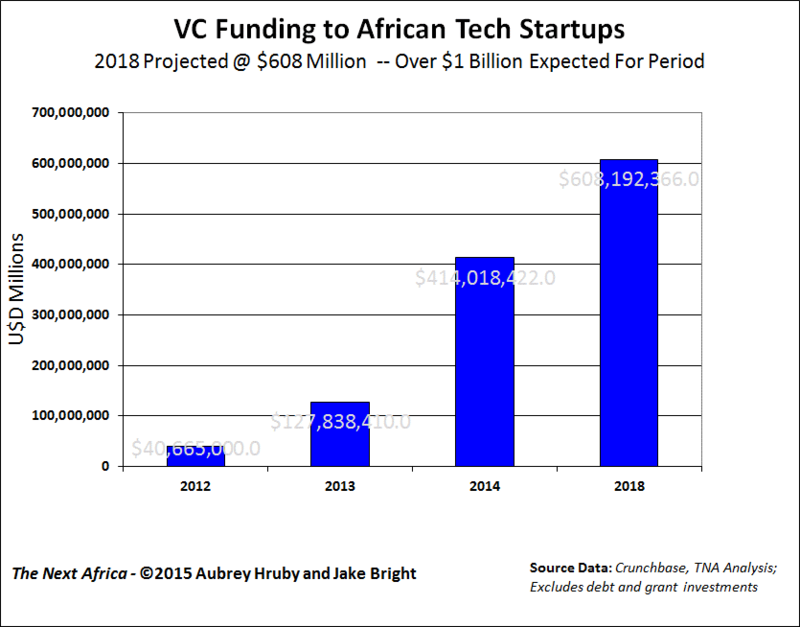 The research I’ve done with Aubrey Hruby highlights the existence of roughly 200 African innovation hubs, 3,500 new tech-related ventures, and $1 billion in venture capital (VC) to a pan-African movement of start-up entrepreneurs. Increasingly, Nigeria is becoming a centre for big tech investment and commercially oriented start-ups. Whatever the country’s challenges, investors and entrepreneurs are attracted by the prospect of scaling applications to Africa’s largest population and economy. Many have set up shop in Lagos’s Yaba district. There you can find the headquarters for e-commerce start-up Africa Internet Group and digital payments venture Paga, located near incubators Andela and Co-Creation Hub. Nigeria’s tech sector is becoming representative of repatriate entrepreneurs reversing some of Africa’s brain drain and IT reshaping the continent’s global linkages. All three of Africa’s most recognized e-commerce startups – Jumia, Konga and MallforAfrica – were founded by Nigerians who earned their university degrees and initial private sector experience in the US. A noteworthy portion of the roughly $600 million in VC to these entities comes from American and European investment firms. And the management of Jumia’s parent, Africa Internet Group, is a mix of repatriate Africans and MBA types from the US and Europe attracted to the continent’s IT opportunities over development work. From Nigeria to Kenya, and Rwanda to Ghana, tech innovation is starting to influence multiple sectors: energy, agriculture, banking, healthcare, entertainment, transport and fashion. Having researched the topic for the past six years, I believe technology in Africa has the potential to create more impact faster than anywhere previously in the world. There’ll be a lot to unpack on that prediction. To start, here are some trends to watch in the continent’s wired future. The African Development Bank estimates that 55% of sub-Saharan Africa’s economic activity is informal. That’s a massive commercial space without such services as business enterprise software, small business banking, affordable third-party logistics or internet access. Expect VC-backed start-ups to attempt scalable applications for nearly every corner of Africa’s informal economy. Much of this is already occurring in Nigeria. First-time dotcoms are sprouting up for everything from e-commerce logistics, online auto sales and real-estate listings, to airline bookings, employment sites and credit rating services. The opportunities are infinite, especially as Africa’s broadband and smartphone penetration rates continue to improve. Following the lead of countries such as South Africa, Botswana and Kenya, there are growing expectations on African governments to flesh out ICT plans and infrastructure. Countries such as Ethiopia, Nigeria and Ghana are already feeling the pressure, conscious of the success of Silicon Savannah and recent gains by the government of Rwanda. IT will continue to be employed to solve long-standing African socio-economic issues. Aid-agency grants previously going to NGOs are already being diverted to social-venture focused African tech organizations. IBM’s Lucy Project is directed at solving “Africa’s grand challenges” – many of which have been relegated to the development sector. Cracking the continent’s long-standing problems will increasingly become a commercial tech opportunity. M-Pesa has become a case study for global digital payments. Ushahidi was used in the 2012 US presidential election. Africa’s solar powered BRCK wifi device is bringing connectivity to internet deadspots in Wisconsin. Uber is experimenting with new service models in Africa that company executives tell me could later apply to operations globally. Commercial drone delivery is likely to take off first in Africa. Most of SSA’s tech applications are developing as solutions to local challenges, but this is creating unforeseen opportunities for other markets. Ushahidi played a role in Kenya’s last two elections. Digital media investigative site Sahara Reporters’ corruption reporting has led to the dismissal of senior Nigerian government officials. Social media applications Twitter and Facebook were heavily utilized by civil society organizations, opposition groups and political parties in Nigeria’s last presidential election. And African technology actors are closer to creating industry lobbying groups. As Sub-Saharan Africa and its citizens become even more connected to the digital grid, expect IT to influence how politics and elections are done. I throw this in for balance. Among sub-Saharan Africa’s start-ups in particular, there will be many failures. Most of these ventures are operating in ICT environments lacking much of the baseline infrastructure for tech – namely affordable broadband and regular electricity. But as I’ve often pointed out to sceptics of African IT, failure is not necessarily a bad thing. It shows investors and entrepreneurs are committed and trying. Some 90% of US start-ups fail. But that means 10% succeed. A similar principle will apply in Africa. The momentum leading many African start-ups to fail will inevitably lead to the handful of monumental technological successes. Following trend 6, it’s only a matter of time before some of the region’s commercially oriented start-ups create Africa’s first big headlines, i.e. IPOs, acquisitions and unicorns. We already had a preview of this with Africa Internet Group’s recent Goldman Sachs-backed billion dollar valuation, followed by reports that fintech company Interswitch may soon go public on a major exchange – likely the London Stock Exchange. This article is part of our Africa series. You can read more here.